The television industry is about to be turned upside down with the Google Android powered TV! 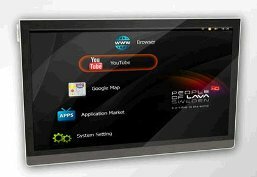 A company in Sweden called People of Lava are currently beta testing televisions that run the Google Android operation system. According to Wired.com, the TV is set, fittingly, to enter beta-testing in early Summer, and other than size and price, tech-specs are still to be finalized. The first model will have a 42-inch high-definition LED screen and cost between $2,000 and $2,500 ($2,700 and $3,400). This will be followed by 47 and 55-inch models. An internet-connected TV is surely a Good Thing, allowing things like YouTube, Netflix and Hulu to stream straight to the big screen. The use of Android, too, seems smart: it already works, it’s free and it is all about the internet. I am of the opinion that the next frontier of web access, beyond the mobile phone, is the television. Wouldn’t it be awesome to just sit down, access Netflix and then stream any movie you wanted? And while the movie is playing, have some other windows open like Gmail, Facebook, and Twitter! Plus, with a Google Android power television set, you can be sure that the picture quality and resolution will be supreme.